Here’s a fun project to take to the next family gathering, or a creative escape for home. Paper Pumpkin is a monthly craft kit that comes right to your mailbox. Check it out at mypaperpumpkin before the 10th to get the next kit (Thanksgiving themed). There are 30,000 subscribers, so don’t miss out! 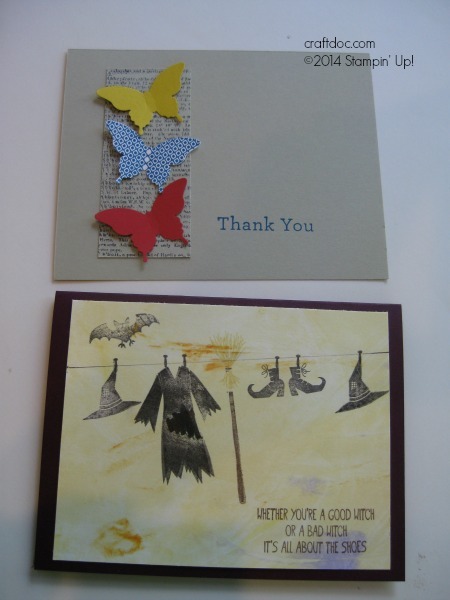 Here are a couple more cards from our last Erie, PA demonstrator meeting. -the shaving cream technique was used for the background on the second card. -just use a ruler and Stampin’ Write marker to draw the clothesline. The Tee-hee-hee stamp set includes the cute little clothespin!